What a shock!!! We are getting our street repaired and of course, there are many trucks and worker bees outside our door. 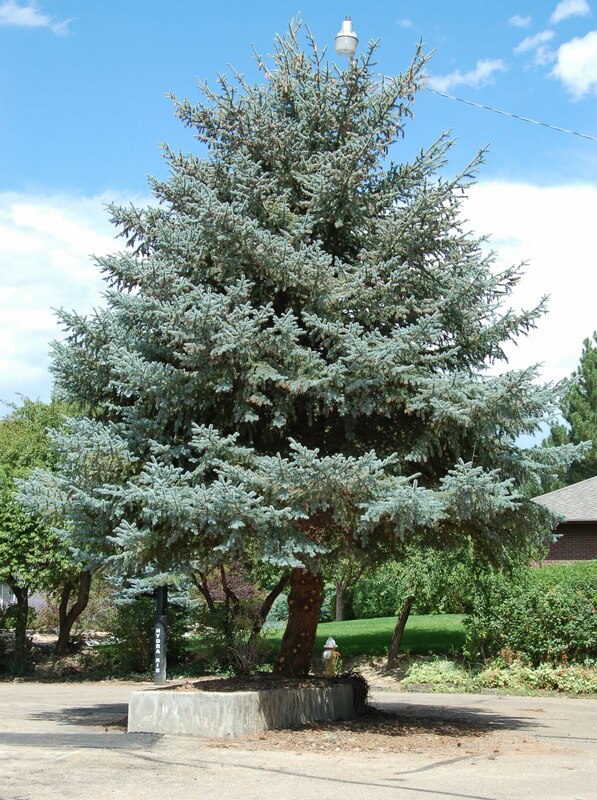 However, we did NOT expect that they would give our glorious Blue Spruce a haircut on it's bottom half. Seriously, there were two 4 foot piles of branches left, when they were done. I will say, that trucks have had a difficult time turning the corner with all the growth that had taken place in the last 6-8 years. However, we loved the look, and now it looks.... well.... naked! We will plant bulbs and try to make it lovely for the coming years, but honestly, I wept a little bit for the lost glory (and humiliation) of this grand tree. were actually touching the ground. because of the pile of needles underneath. 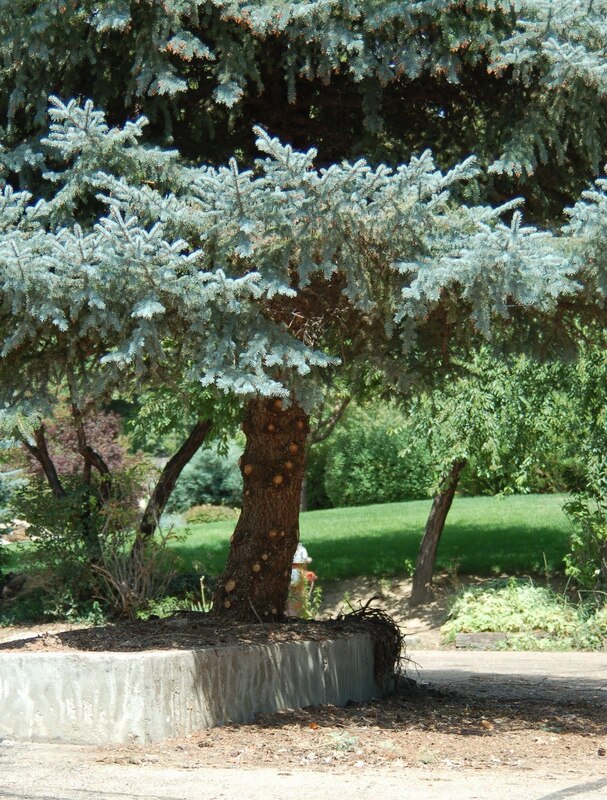 the tree, we now have room for plantings. I am back..... whew, last week was a rough one. Too many obligations and not enough time. Throw in a bit of stress, and voila.... migraine! By Friday, I was down for the count and it took several days to pull myself together. However, before I was struck in the head.... I managed to do some work. I finished the piece that I was working on.... actually it's in the 'resting stage' for a few weeks. I have moved on for a bit, but will come back to it. I took two photos and I just thought that you might enjoy seeing how the flash vs non-flash works. I can't decide which one I like best, but photography can really affect the work. This week is hectic, as well, so hopefully, I can get into the studio and get some work done. I promise to have something to show, soon. As you can see, I am finally getting my photos back on line. We had nothing but trouble yesterday....but eventually (after heading to the Computer Store.... thinking it was fixed .... and then coming home and spending two more hours on the phone....) managed to get everything to work. Sometimes, computers take up too much of our lives! I love the bark of an Aspen Tree. Other bits of news that probably will not be important to you but is to me.... I heard from my son today. He was 'on the road' and is going 'on the road' again..... visiting NYC, and then moving from the Bay area north to Portland. I don't think our kids realize just how much it means to know that they are happy, healthy and doing okay. It doesn't have to be great all the time, but okay is good...and knowing that they are okay is even better. Kids do not like Mom's to 'bug' them...so sometimes, we let them "be" for a while (and believe me, it kills me to do that, as I am the best "Helicopter Mom" on this earth!). Great book recommend by my mother. I wish I would have read it earlier, but then again it was recommended by my mother and I thought it would be too sappy. Not true at all. I love my mom but the sure way for a man not to read something is for his mom to recommend a book. Even if my mom was Daryl Hannah. That brings a smile to a Mom's face. I know.... it has nothing to do with Botanical Illustration. My life is filled with Art and I love it..... but nothing.... NOTHING.... comes close to the love and passion I have for being a Mom to the two best kids around. So, lastly, here is my quote from "The Help" which I loved reading and I plan to see next week with two girlfriends. It is a quote, from the book and in the movie.... and it is meant for every child out there, but, most especially, mine. Today we took our computer into the store for a checkup. See, the photo part of my computer is NOT working and it needed to be fixed, before I could show more photos, etc. So, I am going with "patience" this week and will patiently take my computer back to the computer geek to solve this problem. Hiking at Caribou Ranch is a favorite thing to do. We usually get there just in time for the wonderful wild flowers, which pop up in July. However, this year, we headed to Jackson Hole, WY, which put us behind on our Caribou connection. Off we trundled on Wednesday, for a lovely morning of walking, talking, sharing memories of our many years together. It was a quiet respite in an otherwise crazy busy week. I share some photos with you, in hopes that you can find a quiet moment of calm. Hi..... I will be hiking, and schooling for the next few days, so I don't plan to blog for a bit. Wednesday is our Anniversary....and we plan to hike and enjoy the day together. That is something that we could not do in the past because of work.... but retirement affords us the luxury of enjoying a day in the mountains to celebrate 42 years of marriage. Thursday is a school day. Just like the kids, I am heading off to class at the Botanic Gardens. I can't wait. I have all my pencils and paints in my pack and I am ready to learn new things. And I choose..... "Life is Good" How about you? Choose to be happy today...and maybe we can change the world. Last Friday, I started sketching the fruit of the Quince bush outside our front door. Last year, there was very little fruit, but this year, the tree is filled with these very hard little treats. So, I continue to work on it.... and I thought you might enjoy a peek. I will photograph it again, when it is complete. several things at the moment. so I continue to add as I go along. Here's a completed drawing from several weeks ago. I heard from a reader, that it's nice to see the work in progress, but sometimes I forget to put it on the blog, when it's done. 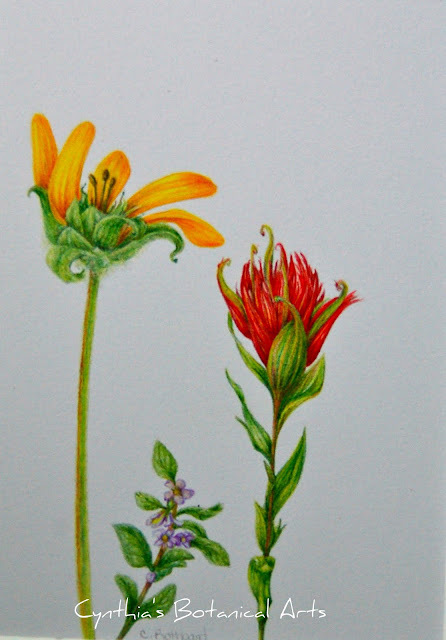 Remember the sketches that I did in Grand Teton National Park (with crayons and a steno tablet)? With notes and the sketches, I worked on the piece below. I did manage to complete something this week. It's getting harder and harder to find time in my studio, but I continue to give it my best shot. This week, I did manage several days of work. First piece today.... another completed one tomorrow. It's time! Our window boxes are starting to literally fall apart, and we have never had any trim on them. Several, were also starting to rot, so the wood needed to be replaced. My husband has been measuring, sawing, repairing and painting for the last week or so....and I can tell you that the window boxes are looking much better.... Terrific comes to mind. put it all back together, better than ever! that needed a lot of repair. Don't these look a lot better? Now, scraping and painting the shutters begins.